Before the recent ban on a number of substances previously available in Head Shops in Ireland, a group of Irish based pharmacology researchers (see research poster for full list) set out to identify the constituents in a number of the best selling products available in Head Shops in Dublin. Eighteen samples were obtained and tested. The products selected were based on reported popularity and employees' recommendations of the “best buzz” available. Dr. Pierce Kavanagh, an Organic Chemist from The Department of Pharmacology and Therapeutics, School of Medicine, Trinity College explains the reasoning behind the project. "Our first real research interest in these Head Shops ‘legal highs’ was raised late last year when we were presented with the task of identifying an ‘unknown’ in one of the products. After some detective work we identified it as MDPV. Leading on from this we decided to embark upon a more general project to profile exactly what was out there. During numerous visits to Head Shops we obtained a number of products for analysis. Some of the analysis was quite straightforward and the products contained easily identifiable cathinones but some were a little trickier." 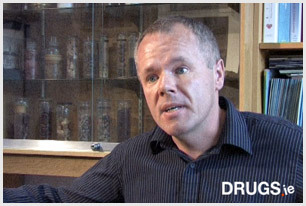 Speaking after the recent move by the Irish Government which has seen a number of substances on sale in Head Shops being banned, Dr. Kavanagh commented "We have characterized a number of products to date. As such information is of use to law enforcement officers, addiction counsellors and emergency medical personnel, we have compiled it into an easy to read pictorial format "
The research recently won the Best Poster prize at the at the 32nd All Ireland Joint Schools of Pharmacy Research Seminar, held in the School of Pharmacy in Quess University Belfast. A few weeks before the recent ban on certain head shop substance came into place, we filmed Pierce discussing aspects of the research and some interesting 'post' ban predictions. You can watch the results below.